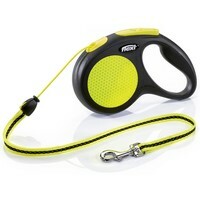 Flexi Neon Retractable 5m Cord Lead is a high quality lead that provides better visibility and better protection while walking your dog in dim or dark conditions. Designed with a sleek black and yellow design, this stylish Flexi lead features large-surface reflective films on both sides of the casing which can reflect headlights from up to 150m away. The tape has also been made out of a bright neon yellow material with reflective stitching to enhance visibility further. The Flexi Neon Lead also has a comfortable, ergonomically designed handle and has a quick response braking system with a reliable braking button to ensure the highest standard of safety and comfort on your walks. The lead will extend up to a distance of 5m (16ft), allowing your dog plenty of freedom, whilst allowing you full control and the ability to retract your pet as needed.